We are so close to the next release of the Stamp of Approval collection, this time with a very tropical flair. Tropically Yours is the new collection, full of fun images, gorgeous sentiments and other surprises. If you came from Jenny’s blog you’re at the right spot. Otherwise, feel free to start at the beginning of the hop here. I created an entire set of cards for the first day of the hop, showcasing the Leave me in Paradise set from the Tropically Yours collection. I hope you enjoyed this blog hop, the first inspiration for the Tropically Yours Stamp of Approval collection and my video. If you liked the stamps and dies, don’t forget to sign up for the waitlist here so you get an email once it’s available. Fun cards, Josefine, and a great way to let the sentiments shine! Love these colorful cards. Wonderful stamp set! Thank you for sharing! I love the simplicity of your cards! Beautiful! Beautiful set of cards Josefine! I love your monochromatic cards. The sentiment really pops on them!! Pretty cards. Great way to show how this product looks with different colors. I love your backgrounds … what yummy colors! Wow! What a quick way to make great cards. They look wonderful. Thank you for your inspiration! I love how you did those cards! Beautiful cards from this gorgeous release! Lovely cards – great colors. Thanks for showing this technique. Who doesn’t love the tropics! Catherine’s inks made these cards extra special. Great job! Simple and beautiful. I love how you used one color for each card and let the sentiment shine. These are gorgeous and I love the way you stamped the background, that’s so cool! Love the colors you chose. It would be a great set to give as a gift! I like the sentiment being highlighted by the stamped background. Cute cards! Great way to make a background quick! I love that technique you sharing using the stamps layed out just like they are on the packaging to make a great background. I am definitely going to try this. Great simple cards that really showcase the sentiments! Brilliant technique for super simple, yet elegant background! Thanks for sharing! These are my favorite cards today! I enjoyed your video and love ideas to make great cards quickly and easily. Thank you so much. Wonderful use of those tropical leaves! What a brilliant idea for monochromatic cards. I’ll have to try this technique. So glad you shared this. I love how quickly you put these together. They are fantastic! That’s so awesome and lovely. Can’t wait to purchase. I love a stamped all over design like this. Gorgeous collection of cards! Perfect design to show off the lovely sentiments and beautiful tropical leaves. I love how you kept the stamps mounted on the plastic to create the background. Quick, easy and stunning! Such a pretty and colorful set of cards! Love the new technique, something I could use often for quick and easy backgrounds. Fun, gorgeous, fabulous monochrome cards, Josefine! I feel like a broken record on this hop because everyone’s projects are just so way beyond fabulous! Awesome idea for creating some beautiful and easy cards! Thanks so much for sharing your video with us!! Clever and quick way to make a beautiful background. Love the cors. Really are tropical. Thanks for the video. I love using stamps straight from the package and am glad someone else does, too! It feels like I am “cheating” somehow, but it is faun, fast, and easy! Great cards! Great set of cards. Love the backgrounds you created. Very pretty! I’m going to LOVE this SOA box! I love the creative sentiments in this collection! Simple but elegant! Nice job! What a good eye you have to have seen how well plate is stamps would make such a nice background. What a simple idea with stunning effect. Your tropical foliage panels almost look like Victorian prints. They really set off those bold sentiments. Thanks for the inspiration, and the instructional video. Beautiful CAS cards! What a great idea to stamp the whole set as they are on the cover! Thanks for the great inspiration! Cheery brilliance in fast card creation ….LOVE! These backgrounds would make beautiful note cards for a gift. It’s a wonderful idea using all the stamps together. Thanks for the inspiration. Terrific cards! These would make a quick and easy gift set! Thanks for sharing on your video! Love your cards!!! What a great way to make a card set! I might have to try this!!! Thank you so much!!! Beautiful.. love how they are all the same but different.. Simplicity at its best. The backgrounds make the sentiments shine. Thank for sharing- I feel as if I could definitely do this technique. What a great idea. Loved all the cards. Thanks for sharing. What a really creative way to use the stamp sets the way they come in the box. I’ll have to see if I have stamp sets all ready to copy your technique. And the Black sentiment definitely stands out on your background. Fabulous. Great ideas for using the sentiments! Great set of cards. They would make a fabulous gift. love the monochromatic color schemes. OMG…Great set of cards, and so quick and easy to make! Awesome cards! I love how fast you made them! I am going to have to try this when I get the collection! Very nice. I never would have thought to use different colors for those leaves. Great job. Those cards are gorgeous. I love the sentiments and I leave those tropical leaves. What a great idea for a quick and easy background. Thanks for sharing your video. a unique look. Great backgrounds. What a clever way to make the backgrounds. oh my goodness…this collection is just too much fun…would absolutely make my year if I won this collection…..so pick me please LOL! See me back here waving frantically??? LOL! So many great ideas on the blog hop – can’t wait to give them all a try! Great set of cards! I need to make these when my SOA box arrives! Love the idea to use all the stamps as a background. I love these Josefine. They would make a great gift card set to give to someone as a present. Beautiful cards, Josefine; simple, but so effective! Thanks for sharing. Fun cute cards, like the simplicity of these. So clever to use the stamps on the packaging as a background. I will always be checking my stamp sets now to see if they can be used this way. What a great technique! And I love that the sentiments are big enough to stand on their own. I love simple! These cards are great. I like to use stamps for backgrounds like these, Thanks for sharing. Wow, simple yet elegant. I really love your set of cards. Love the sentiments in this collection! Great cards. Love these sentiments. Beautiful cards…love the simplicity of them! And, the colors…oh, my. Great set of clean & simple cards. Wonderfully inspiring set of cards! The colors are amazing. So very pretty! Love all the colors. Beautiful cards! I am so in love with these products! Wow creative way of creating your backgrounds. Awesome. Love how easy you made these. Sometimes we need a quick card, so your technique will be beneficial for me. Love how bright and fun these are! Can’t wsit for this box!!! Josephine – what a great use of the Leave me in Paradise stamp set. A good reminder of the impact of simplicity. Stunning. You really turned that leaf stamp set into a quick, simple and clever card set making machine. Talk about a rainbow of friends. The CO colors are perfect (as usual). Thanks for a really useful tutorial. I love the simplicity of these cards! They are amazing! So bright and pretty cards- these would cheer up anybody’s day to receive one! Beautiful cards and they would make a lovely gift set! Really pretty cards – love the colors and of course, Catherine’s inks certainly are wonderful. Great set and so easy. Beautiful cards, can’t wait to get the collection. Love the bold background for quick and easy cards! Wow! Amazing idea leaving the stamps on to do backgrounds, wow! Have to give this a try thank you so much for sharing and being apart of this amazing Blog Hop. Your cards are awesome! Always nice to see a video on how things are done. Thank you! I do love those leaves! Love the use of one color background. Really makes the sentiments stand out! Very beautiful cards. The colours are so pretty and I love the sentiments! Wonderful cards, love that they are nice and simple, but so eye catching! Thanks! What a fun set of cards! Great way to let those greetings be the center of attention! Thanks for sharing your creativity. what a clever idea to make a set of cards! Very creative! Awesome cards!!! I like the black and white version too. It really pops out. Thanks sharing your card ideas and the for the super video. Love your card ideas! Thanks for sharing! How fun to use the whole stamp set as a background! I love clean & simple cards and monochrome cards too. What a great way to make a quick collection of cards. I think my favorite stamp set from the collection is the Tropically Yours with the borders in a close second. Those dies are pretty cool too. 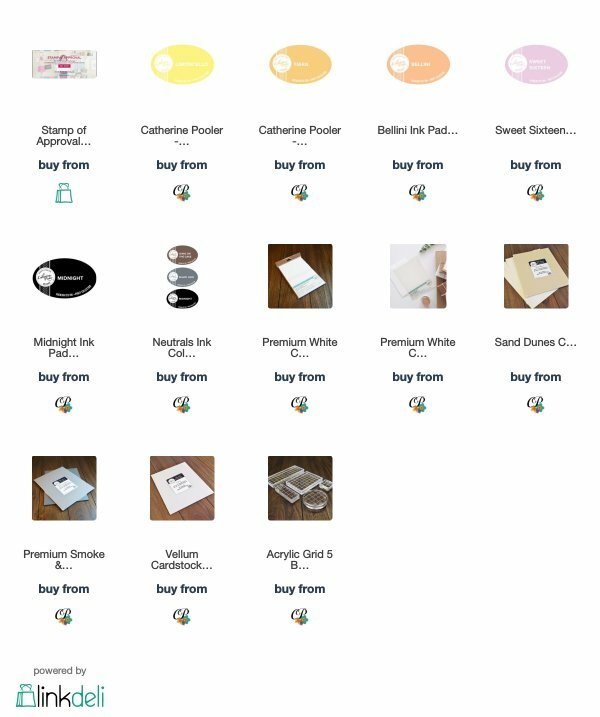 I always say I don’t need any more stamps & dies and then I see the first product reveal and oh well. What’s enough? I like how you used the stamps for a background. I love how the sentiment popos on your cards. Thanking for sharing a clean set of cards. I enjoy your creativity. Wonderful card set, simple yet elegant. Fantastic cards! Love the colors. Beautiful use of these new inks! That was such a great idea! Very quick and beautiful cards. Thanks for sharing. Now I have to go check out all my stamp sets to see if any will work for this! Such a fun idea to go with the single color cards. They are so quick and easy and pack a serious punch! LOVE. Fabulous cards! I love you backgrounds! I really like this stamp set, very nice cards! Fab range of cards shared today. Thanks for sharing your creativity and the tutorial video. Love your tutorial, and your cards are so cute! I love your super fresh set ! That’s all I need this season ! What a pretty set of cards with those tropical stamped backgrounds! love the soft pastels. I just love your pastel stamped tropical backgrounds! This would make a wonderful set of notecards for a gift, or just for fun! My kind of cards – simple and beautiful! Clean and simple cards! Love this collection! These are so pretty. The colors really pop with the sentiments. Nice use of the colors! These cards are so pretty. Love the color contrast with the sentiments. Great use of color!! These are simple and beautiful. I love them. Thank you! Great set of cards. The leaf stamps made an excellent background for the bold sentiments. These simple, graphic cards are so much fun. This is a great collection! Cute set of cards and great colors. Very pretty! I love the colors of the backgrounds. Love the colors you used! Such simple, yet beautiful cards!